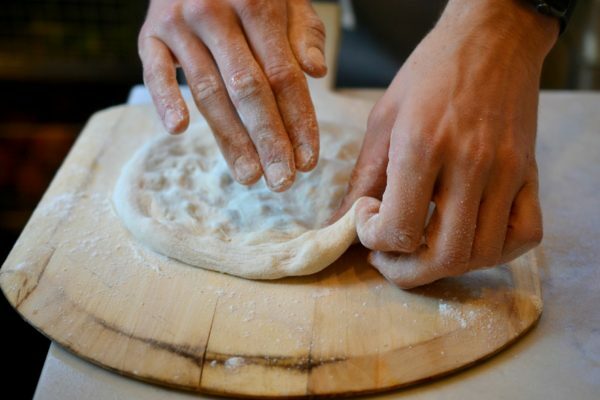 Most of us eat a lot of pizza, but when do we ever take the time to make it ourselves? 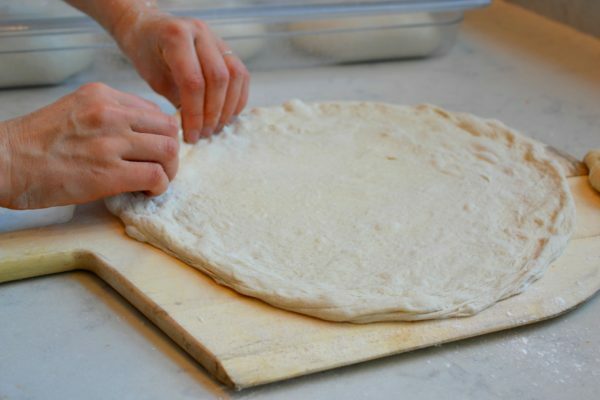 Making your own pizza from start to finish can be fun and surprisingly easy. 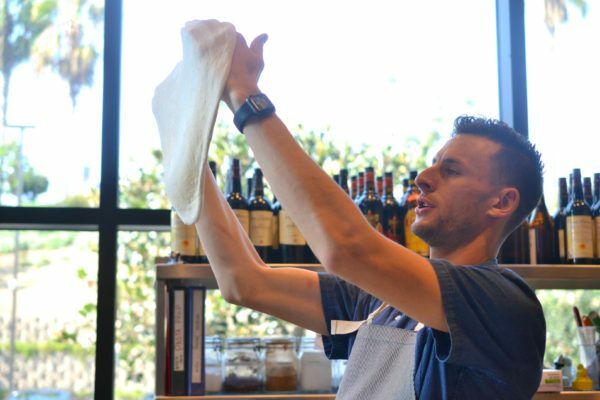 At a recent pizza tutorial hosted by North Italia, in honor of National Pizza Month, we had a chance to brush up on our pizza-making skills and learn some new tips as well. 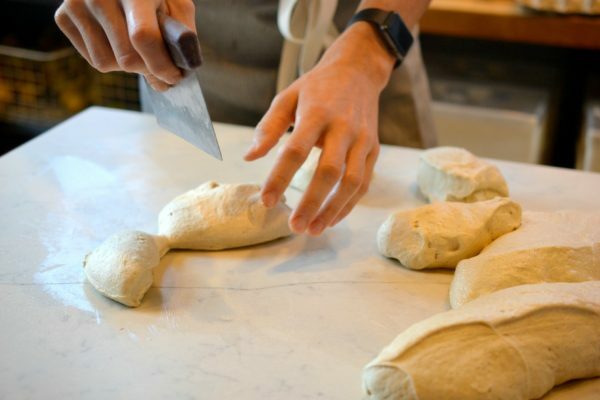 Led by Chef Sammy Sleman, we started with a beautiful, pliable dough that was made fresh in-house by the North Italia team. 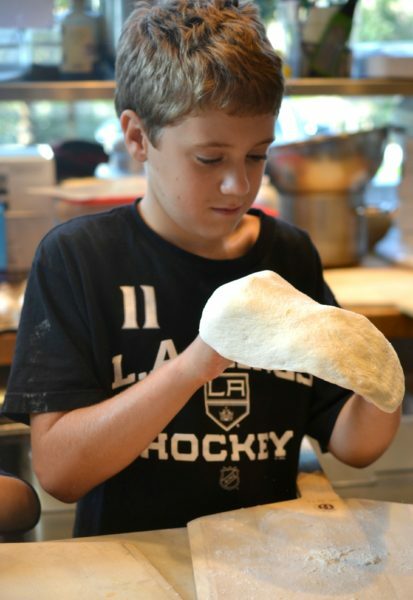 The dough is made from a special blend of flours that includes powder-fine 00 flour and rye flour. To get the pizza tutorial going, Chef Sleman chopped the dough into perfect 9-ounce chunks; then we had to gently shape each chunk into a ball. Next, the neatly shaped dough balls were left to rise for about six hours. (Chef Sleman conveniently had some already-risen dough waiting for us.) The dough was perfectly soft and pliable, and it was especially easy to work with when there was a light dusting of flour on the board. We gently shaped each ball into a flat circle. Then, explained Chef Sleman, you put your fist under the dough and gently spin it, letting your knuckles flatten out and stretch the dough (or if you’re a pro, toss it into the air). Got a circle you’re happy with? Brush the edges of the crust with olive oil, and then you’re ready for sauce and toppings. 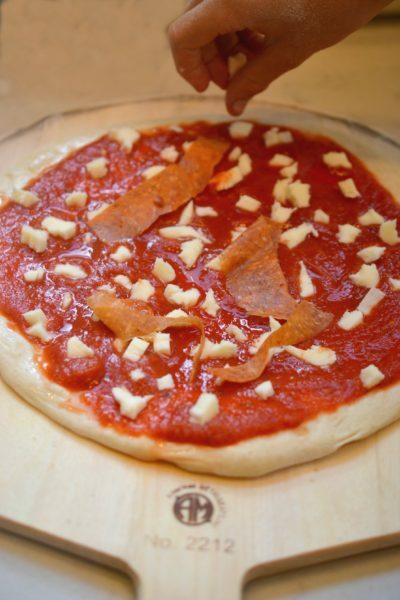 Sauce-lovers take note – Don’t put on too much sauce or the pizza will get soggy and stick to the pizza peel. 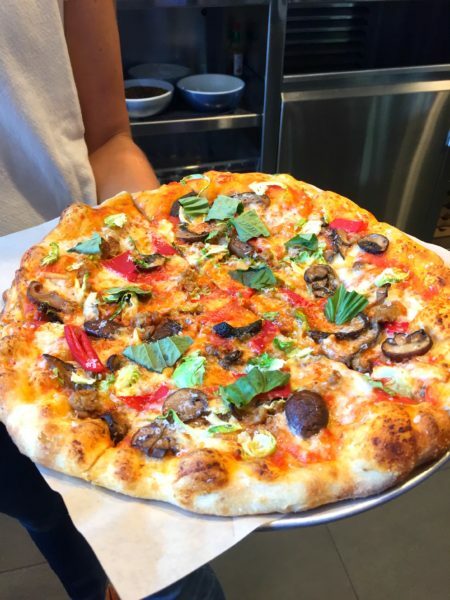 Chef Sleman helped one young cook at the pizza tutorial overcome that problem by lifting up each section of his pizza and putting a dash of flour underneath to help it slide off the peel into the oven. 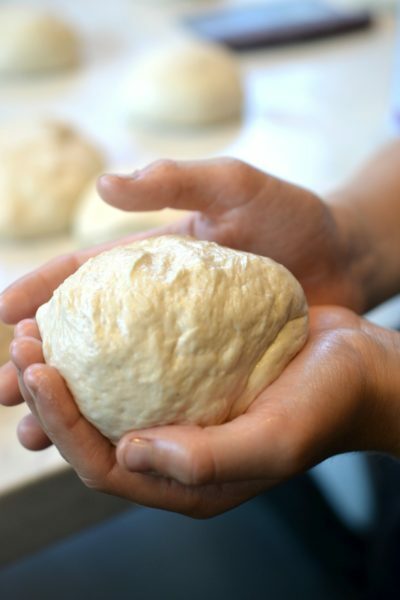 But as you’re doing this, it’s easy to risk tearing the dough in the center. Our advice: take it easy on the sauce. Next, you bake it. 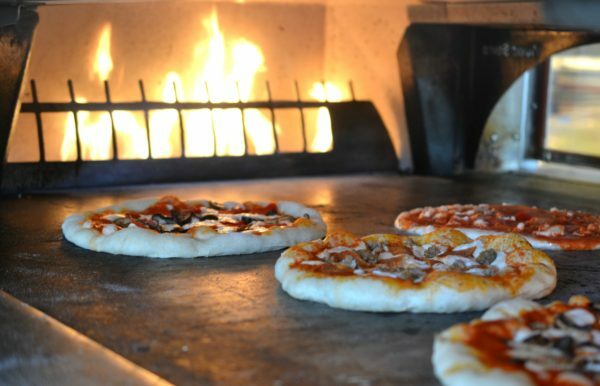 If you have a professional pizza oven at home, that’s great; but for the rest of us, it can be tricky to get that perfect heat to ensure a crispy crust. For home cooking, experts recommend heating your oven to 500 degrees for about an hour before you are ready to cook the pizza. Seriously, don’t skimp on this step…it makes a huge difference when the oven and the pizza stone are thoroughly and evenly heated by the time you slide in your pizza. This pretty pizza was made at the tutorial by our pal Amelia from Eating Made Easy. Give it a few minutes (in this professional oven it took 12 minutes) but watch your pizza closely. Signs that your pizza is done are a golden-brown, slightly puffy crust and bubbly toppings. If you’re using fresh herbs like basil, put them on after the pizza has been cooked so that they stay fresh and green. And then… it’s pizza time! 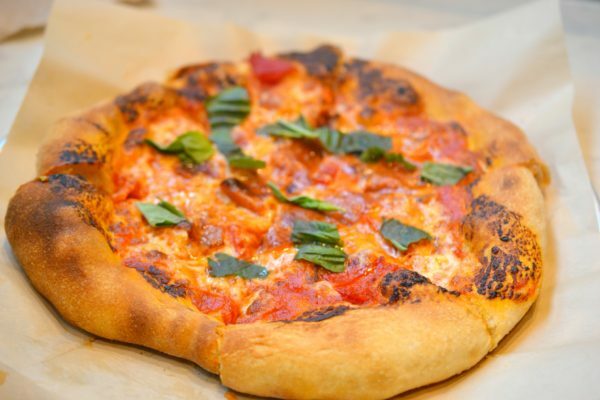 Do you taste a difference between homemade pizza and the pre-fab variety?